Objective: Work hour limitations have made a detailed sign out essential to ensure patient safety and continuity of care. Patient education is also vital to assist in making an informed decision. Utilizing available technology and integrating it into our daily routine is imperative to establish these goals. The use of cell phones, smart phones and personal digital assistants (PDA), improves communication and efficiency between residents and attending physicians, facilitating a meticulous sign out and enhancing patient care and education. Materials and Methods: Data was gathered in a community teaching hospital, where handheld devices, were used to stream videos of laparoscopic surgeries from the SAGES website to patients and their families prior to obtaining informed consent for laparoscopic surgery to demonstrate the details of operations and help answer questions and provided a visual description of the procedure. Handheld devices were used routinely to provide baseline photographs of patients with complex wounds on admission. Photographs were de-identified, and were only verbally discussed during sign out to maintain patient confidentiality. Photographs were also sent by the residents in the emergency department to attending surgeons to document a wounds baseline appearance. Wound progress is followed with daily digital photographs prior to dressing changes, and is communicated to all members of the team and the attending physician via instant multimedia messaging. Preliminary Results: Educating patients about their operation by showing them videos before their surgery enabled patients and their families to make a more informed decision. They had fewer questions about their procedure and were more comfortable with their decision after the video demonstration. Using photographs of wounds from the ED allowed for a decrease in the amount of time taken for the initiation of appropriate therapy. It also saved time during sign out and provided a more detailed description of patients’ clinical situation. We also received a positive feedback from patients who became more involved in their own care when they were shown the progress of their wounds at the bedside using before and after photographs. Conclusion: The routine use of digital photographs and multimedia messaging in our program proved to be very successful. Utilization of current and available technology is effective in patient education. With appropriate physician’s guidance, the selective use of videos are informative and educational for patients and their families. A future direction may involve emailing patients a link to SAGES Surgical WIKI to review the basics about the relevant surgical procedure prior to their outpatient appointment in order to enhance experience. 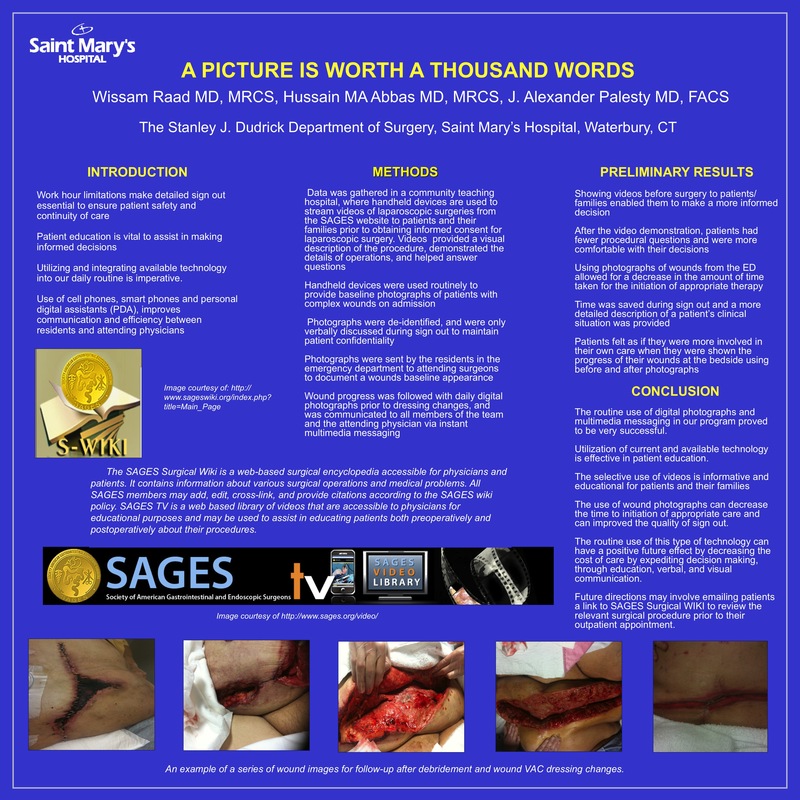 The use of wound photographs may decrease the time to initiation of appropriate care and may improved the quality of sign out by providing a more timely and accurate description of the wounds to the attending physician. The routine use of this type of technology may have a positive effect in the future on decreasing the cost of care by expediting decision making, by both the patient and the physician, through education and verbal and visual communication.